The story is told my Beatrice who lives in America with her fiancé, but who comes back to the UK when her younger sister Tess goes missing. 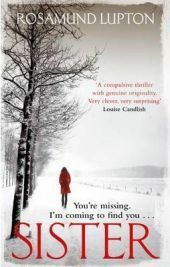 A few days later Tess is found dead and although Beatrice knows that Tess would never willingly have taken her own life, everyone else including her mother, her fiancé and the police, are all convinced that it is suicide. Tess refuses to accept the verdict and subsequently sets about trying to find out what really happened to her sister. In doing so, she discovers many things about her sister and is quite often disturbed about the things that Tess chose not to share with her. Despite being told off by the police for being a nuisance she continues to dig into what happens even if that means putting herself at risk. As the story moves to wards its gripping ending, the reader cannot fail to fear for Bea’s safety! The book is written in a most interesting way as it is Bea writing to her dead sister and chronicling everything that has happened from the moment that she heard that Tess was missing. This made the style quite chatty and informal and made the relationship between the two sisters feel quite real. I also felt that the story line was very good too. There was lots of twists and turns but the story was always very plausible and with not too many twists to be confusing. Every time that I thought I was able to predict where the story was heading, something new was introduced which meant that I had to revise my thinking. I really like that in a good thriller as I don’t like it to be too predictable. Especially towards the end I was expecting a few surprises and I was not in the least disappointed. It was well paced throughout with every chapter broken up into lots of shorter sections which made it east to keep on reading just that little bit more. Beatrice made a great storyteller and I loved her dogged nature which meant that she never gave up in her quest for the truth. We met a number of other characters who had been involved with Tess while she was alive. On first appearances some seemed very nice whilst others quite sinister, but you soon learn in this book never to trust anyone. Beatrice does learn this too but is it too late the reader might wonder! I thought that Sister was fabulous – stylishly written, a great storyline and believable characters. I definitely recommend it. I didn’t expect to but absolutely loved this book and have passed it on to my own sister to read! It was also a big conversation starter on holiday as many people came over to tell me they had also read the book and enjoyed it. I thought the end was excellent!